Christine King Farris (born Willie Christine King; September 11, 1927) is the eldest and only living sibling of Martin Luther King, Jr. She teaches at Spelman College and is the author of several books and a public speaker on various topics, including the King family, multicultural education, and teaching. Professor Farris was, for many years, Vice Chair and Treasurer of the King Center and has been active for several years in the International Reading Association, and various church and civic organizations, including the National Association for the Advancement of Colored People and the Southern Christian Leadership Conference. 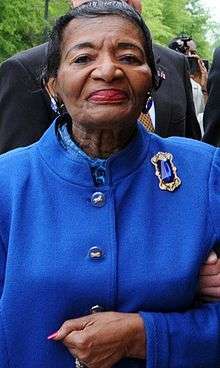 She is the first child of Reverend Martin Luther King, Sr. and Alberta Christine Williams King, and is the elder sister of Rev. Martin Luther King, Jr. and Alfred Daniel Williams King I. The three siblings spent their early years in the home of their grandparents, Adam Daniel Williams, who died in 1931. Christine Farris married Isaac Newton Farris, Sr. on August 19, 1960. They had two children: Angela Christine Farris Watkins and Isaac Newton Farris, Jr., who is the past CEO of the King Center. Farris has endured the murder of one brother in 1968, the drowning of another brother in 1969, and the murder of her mother in 1974. Farris has not returned to Memphis, Tennessee, since she traveled there after the assassination of her brother to retrieve his body. In recent years, she has attended the funerals of her niece Yolanda King and sister-in-law, Coretta Scott King. In an interview with CNN, she said she would not attend an April 2008 event marking the 40th anniversary of her brother's assassination, because of the painful memories of her last visit to Memphis. Farris, Willie Christine King, ‘‘The Young Martin: From Childhood Through College,’’ Ebony, January 1986.